Young children have many opportunities to develop their mathematical thinking. 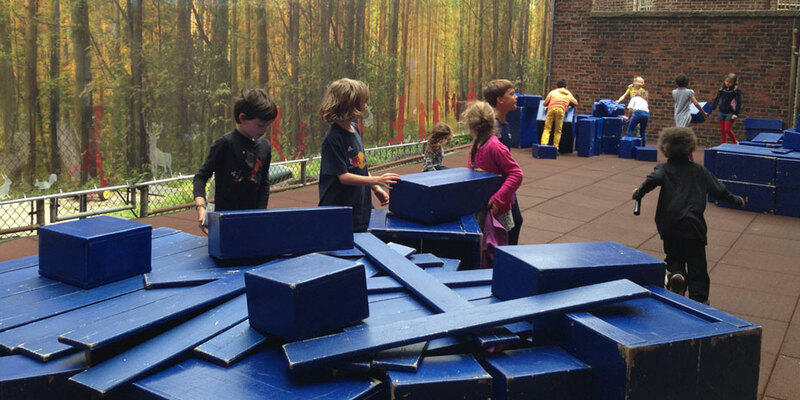 Children in the 4s are guided as they make discoveries about number and shape in the context of their work and play. Formal daily math instruction begins in the 5s. We use Investigations in Number, Data and Space, a constructivist curriculum that provides children with hands-on experience through which they build mathematical understanding and skill. They explore the distinct mathematical strands of number and operation, patterns and functions, data and probability, geometry, and measurement. Assessment of their mathematical skills and reasoning happens through daily teacher observations, analysis of children’s work, and performance assessments built into the curriculum. The Lower School math curriculum, Investigations in Number, Data, and Space, gives students a strong foundation in the mathematical strands of number and operation, patterns and functions, data and probability, geometry, and measurement. Students use mathematical skills to identify and solve authentic problems. While students master computation skills, we emphasize developing strong mathematical reasoning and problem- solving, as well as the ability to communicate clearly about math. As in the lower grades, assessment for this age group happens through daily teacher observations, analysis of children’s work, and performance assessments built into the curriculum. Whether building with blocks, preparing class snacks, or keeping track of the jobs people do in the neighborhood, children in the 4s are using numbers to make sense of their world. They begin to move beyond rote counting to a deeper understanding of numbers as representations of specific quantities. They use simple charts to represent data, and play games that involve sorting, classifying, comparing sizes and quantities, or identifying patterns. The 5s math program introduces children to many of the materials, structures, and routines that they will be using throughout the Lower School years. Students use daily practices like studying the calendar and taking attendance to build number sense. They refine counting skills, compare quantities, and add and subtract small numbers, using cubes or other math materials to make the work concrete. At the same time, 5s begin to use number sentences (equations) to represent computations with pencil and paper. They develop logical skills by sorting and classifying shapes according to different attributes, and by identifying and describing simple repeating patterns. Children design surveys and keep track of responses, learning to interpret real-world data. Young mathematicians in the 6s are becoming comfortable working with numbers in more abstract ways, acquiring a stronger understanding of the base-ten number system. Through games and story problems, students’ work focuses on gaining an understanding of addition and subtraction, using numbers and notation to represent these operations, and finding different strategies for solving problems. They also discover more real- world uses for measurement and data analysis, and continue to work with patterns, functions, and two- and three-dimensional shapes. Develop strategies for accurately counting a set of objects by ones. Use the concept of equivalence. Use manipulatives, drawings, tools, and notations to show strategies and solutions. Construct, describe, and extend repeating patterns. Carry out data investigations and represent data visually. Describe, identify, compare, and sort two- and three-dimensional shapes. Understand length and use linear units. Make sense of strategies to solve addition and subtraction problems with small numbers. Gain fluency with addition combinations of 10. What strategies can I use to count this set of cubes accurately? Is there a way to share a limited number of materials fairly? How can I make sure I’ll have enough blocks for my building? What do different geometric shapes have in common and how do we describe them? How can numbers help us identify patterns in the world around us? How can the ten digits, 0-9, be used to make larger numbers? Why is 10 such an important number for us? How do the symbols + and – represent changes in quantity? 7-year-olds deepen their work with number and operations to incorporate new skills like counting by groups, accurately and efficiently adding and subtracting numbers up to 100, estimating addition and subtraction problems up to 1,000, and identifying generalizations about the properties of even and odd numbers. They begin to explore fractions, understand- ing them as ways of representing equal parts of a whole, as well as equal parts of a group. Their work with patterns and functions extends to using tables to represent and predict change in linear relationships, for example, keeping track of how many rooms are in a multi-story building by knowing how many rooms are on each floor. Work continues with telling time, place value, coin combinations, and two- and three-dimensional shapes. A major emphasis for the 8s is on constructing a strong understanding of multiplication and division. 8s conceptual- ize multiplication as a way of representing “things that come in groups,” and work with arrays as a model. They understand division to be the inverse of multiplication; their initial strategies for solving division problems often involve using that relationship. They acquire fluency with multiplying numbers with a product up to 50, and also gain accuracy and efficiency in adding and subtracting numbers up to 1,000. Another key area for 8s is the study of fractions. They become more comfortable working with halves, fourths, eighths, thirds, and sixths, as well as simple decimal fractions like 0.50 and 0.25. Students learn to use graphs to represent linear change, and begin to develop a more refined vocabulary for describing and classifying geometric shapes, including de- scribing and measuring angles. They learn to find area and perimeter and to determine the volume of rectangular prisms. Multiplication and division are still major themes of math work in the 9s. Students gain fluency with multiplication facts up to 12 x 12, and learn strategies for multiplying two-digit numbers. They use their understanding of multiplication, and of factors and multiples, to tackle division problems with larger numbers as well. Their work with fractions becomes more sophisticated, as they begin to compare and manipulate both fractions and decimals. 9s become skillful in analyzing and interpreting data, beginning to apply concepts of prob- ability by determining the relative likelihood of different outcomes. They use line graphs to track rates of change, analyzing, for example, data about the growth rate of a plant, noticing when it grew more quickly or slowly. In the 10s, students work to expand their understanding of the number system to 100,000 and beyond. Their computational fluency increases, and they are now able to examine a variety of procedures or algorithms for computing, including the standard U.S. algorithms for multiplication and subtraction, understanding how those algorithms work, and determining which ones are most useful given particular numbers or contexts. They tackle multiplication problems with two- and three-digit numbers and solve division problems with two-digit divisors. They recognize the relationships between fractions, decimals, and percents, moving between them more comfortably. 10s analyze data in new ways, for example, describing the probability of an event. Their work with geometry extends to structuring prisms, cylinders, and cones, and determining their volume. Compute with whole numbers with efficiency, fluency, and flexibility. Apply familiar mathematical principles to unfamiliar situations. Identify multiple ways to solve problems, and choose among different strategies. Communicate mathematical ideas clearly and concisely. Represent mathematical thinking using models, diagrams, and graphs. Make connections among mathematical ideas. How can I use the relationship between addition and subtraction (or multiplication and division) to solve problems? How can I represent quantities that fall in between whole numbers? Why do some computational procedures work better than others for certain numbers or situations? What is the difference between ways of describing and computing length, area, and volume? Where do number patterns occur in the “real world”? How do I know my answer is correct? Is there another way to check it? How can I use “friendly numbers” or create an equivalent expression that will help me solve this problem?